In the depths of winter, our town environmental officer asked me to plan a ‘Nature Tour’ around the town. I agreed, May or June 2011 seeming very far away and under the impression the tour was for a group of interested but ‘ordinary’ citizens. Suddenly the time is near and the group has evolved into local bigwigs, who may know far more than me. Fortunately we met up by bicycle with some real experts last week and set off on little used trails along the town boundary. Viernheim occupies a relatively tiny area, bounded on three sides by another state and I wanted to stay in Hesse on the tour. Almost immediately we were in a quiet world of mixed woodland running below the crest of Viernheim’s relict sand dunes (dating from the last ice age). A bird trilled off to our right and Dr. D, our guide, identified it as a nightingale, the first I had knowingly heard. We progressed along the edge of a newish golf course, laid out against considerable local opposition but whose margins now provided habitats for various relatively rare plants and orchids with attendant insects including several butterflies. Deeper into the woodland which includes Scots pine and many species like sweet chestnuts and North American wild cherries that have been sown by birds rather than the foresters, we were in a shady cool jungle. Another bird call was identified as a wryneck, a small woodpecker-like bird that is shy and rarely seen. I looked it up later in a bird book and it is a tawny brown with a few stripey bits, certainly not easy to spot flitting about in woodland. 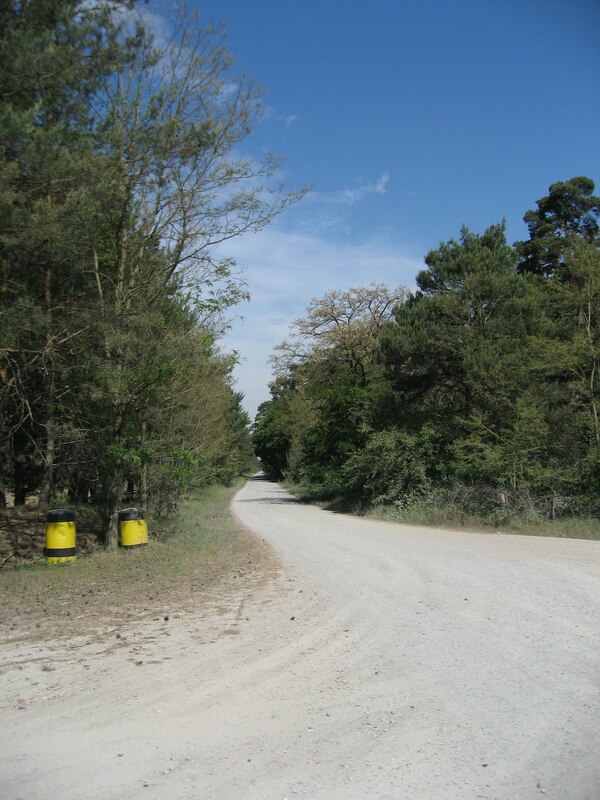 We reached the old boundary road, a sand and gravel route along the crest of the old dunes, still in Hesse but with Baden Württemberg on our left. In a Federal country, such as Germany, this is important since many environmental and educational activities may vary and be differently funded in each state. 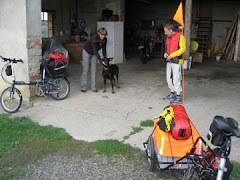 After a short distance one of our companions became very agitated as we passed recent and ongoing forestry activities. 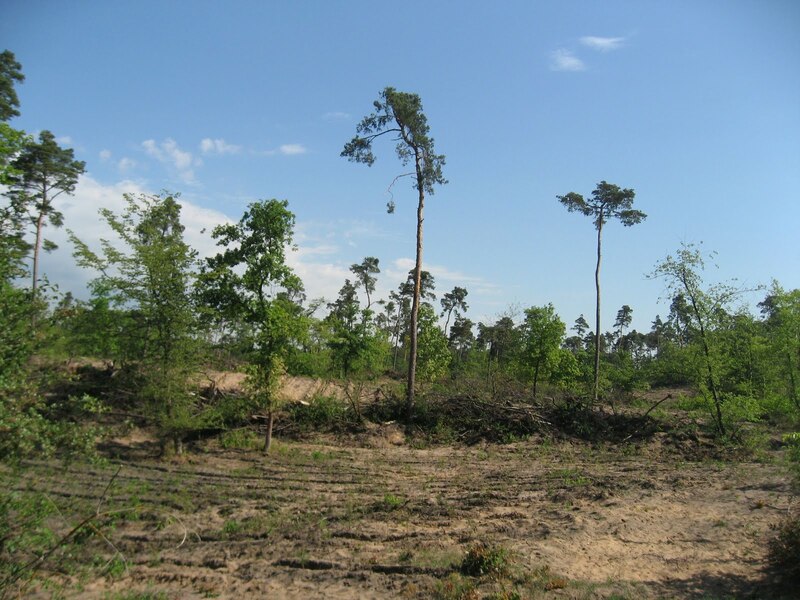 Although certain parts of the old sand dune system are officially protected areas and the whole region is part of an extensive water gathering ground, forests have to pay their way and be managed. Certainly the timber extraction, ploughing and subsequent replanting with deciduous trees has apparently damaged the landscape irreparably, (Photo bottom) but as long as the young trees can survive the current 8-week drought, I expect all will be well in about 5 years. Our Nature Friends have a duty to check excess exploitation and to aid landscape and species protection, but I think this is something I would want to play down on a tour with local politicians. We continued, leaving the sandy trails behind and enjoyed the vast number of greens and browns of the woods, the cries and occasional glimpses of buzzards reminding us that nature, left to itself is a battleground for survival. Our route turned right, over a bridge across the Autobahn, another interruption, another boundary for sure, but also the edges make good hunting grounds for kestrels and living spaces for mice and other small species that are their food. Partly because the forest must be managed, there are bridges and wide access to the woods intersected by major rail and road links. The woods ended suddenly at a wide blaze. Along the centre march electricity pylons, then a major gas pipeline and then a dead straight gravel road before the trees begin again on the northern side. The road replaced the rail link to Lampertheim and was for many years used for tank driving between various US bases nearby. It is known as the Panzerstrasse (tank road, photo middle. Warning notices are still located at the ends and many military vehicles use the road to access shooting ranges nearby. The foresters say that there is disturbance to wildlife, particularly from noise and dust but relations between the civil and military authorities are generally good. Along this road and many of the gravel trails are rectangular, clay lined hollows every hundred metres or so. When it rains they fill with water for wild pig, deer and other creatures. That day we met a forester underway with a tank full of water, for in the forest on our left, unseen to us were ‘nests’ of young pigs, watched over by their mothers. They use the hollows gouged out by the US tanks now reclaimed by grass and bushes as good spots to shelter on hot days. When we redid the route the following day some of the water dips were lined with tiny and big hoof prints. A lack of predators and plenty of food has led to a wild pig population explosion, here and throughout Germany. We followed the tank road back towards town and then turned off through the allotments, a riot of rose blossom and suspiciously green grass. The neat little houses are very unlike the tumbledown, makeshift sheds most Brits equate with allotments. 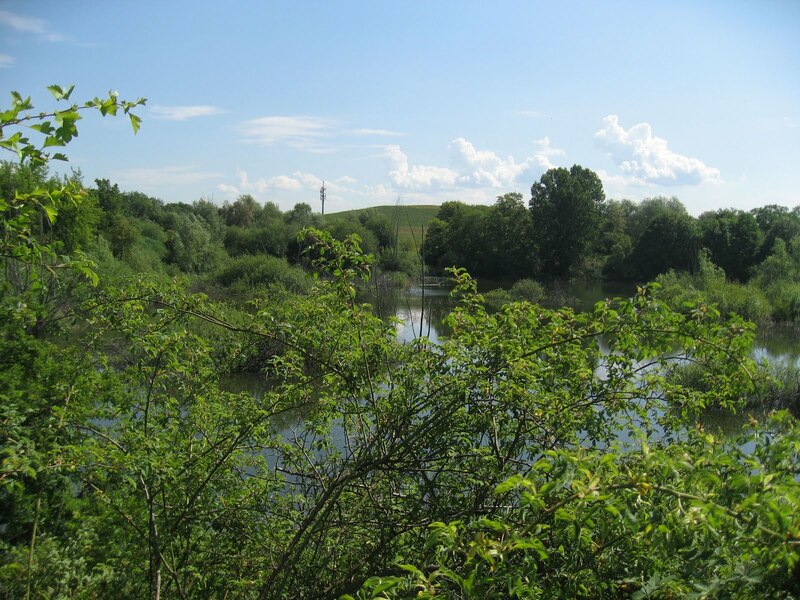 Nearby is a small lake, complete with wild fowl, permanent inhabitants or just passing through. Beyond the allotments we sped off on a rough track, over tree roots and mixed woodland to the base of a ‘hill‘ adjacent to our town compost and domestic waste recycling depot. The hill is man made, the sealed and planted remains of the waste landfill site (Photo top). There are no convenient holes in the ground here in the Rhine Valley, so before more domestic waste was converted into power by incineration, artificial hills were created. 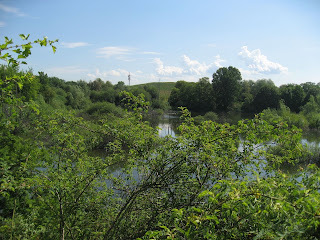 This mound is now the highest point in Viernheim, some 11 metres higher than the ice age sand dunes over to the southwest. We braved attack by ticks to reach the new viewpoint, with 360 degree panorama over the Rhine Rift Valley and its eastern faulted edge of the Odenwald. Up to now our Nature Tour had been mostly concerned with micro landforms, flora and fauna but George Everest would probably have appreciated our glimpse of Southern Germany’s 200+km long macro landform. We had been away from home about 2 hours and returned home, windblown and slightly sunburnt, well pleased with our new discoveries.